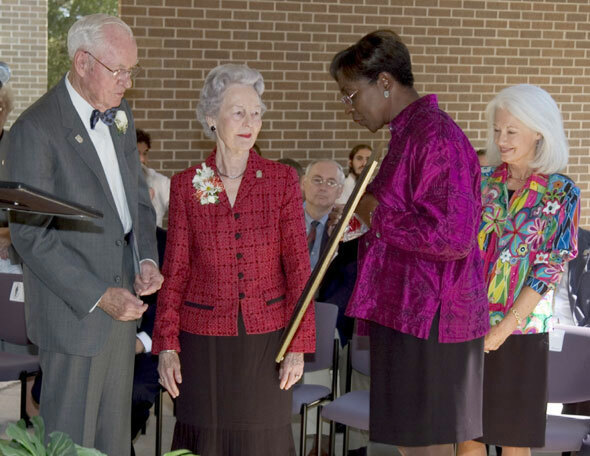 Former colleagues and students, as well as current SHSU administrators and faculty, shared fond memories of Jack Staggs and wife Kathleen at the dedication of the Dr. Jack S. Staggs Counseling Clinic on Thursday (Sept. 30) morning. 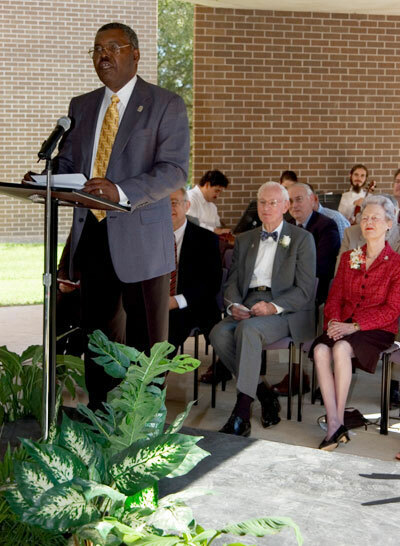 "Sam Houston has been better for his time on campus," one former colleague said. "I can't think of a more appropriate name for the counseling clinic." The clinic is located in the recently-completed Counseling Education Center. (Above) Carol Parker, associate professor of education leadership and counseling, presents Staggs and Kathleen with framed photos to commemorate the ceremony and the clinic. With Parker, on the right, is College of Education dean Genevieve Brown. (Right) Former student Morris Johnson recalls his first encounter with Staggs as he started the doctoral program and shares his appreciation for the former director of education department.